This topic contains 7 replies, has 7 voices, and was last updated by Dadof3Liz 2 months, 2 weeks ago. Every month, we’re giving away a year supply of free crickets. Post a picture of your amazing pet, their kooky personalities, their adventurous habitats or anything else pet related. But how do I do this? Click the Start a Topic button in the upper right hand corner. Upload your picture, and give it the title Cricket Contest. 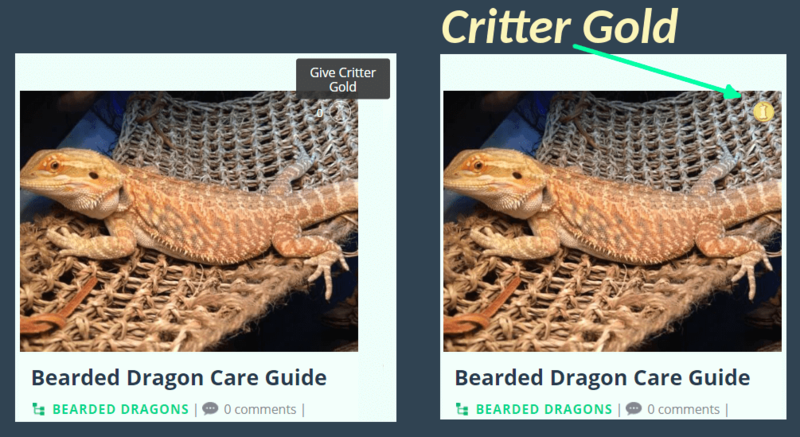 What is Critter Gold and how do I collect it? Critter Gold is a reward system (see here). Every community member has the opportunity to reward interesting posts with Critter Gold. If you want to win a year supply of free crickets, post an interesting picture of your pet or habitat so that community members will reward your post with gold. The winner will be awarded a coupon code for 500 free crickets. This coupon code will be honored for 12 purchases. Winners may continue posting pictures, topics, and questions. But they are not eligible to win until 12 months since they won. Where do we post the picture? On this thread? You’ll need to start a new topic in order to collect the Critter Gold. 4. Recruit friends and family to gift your post with Critter Gold. Yes, do we post here, or somewhere else in the forum? You must register, then click “start topic” to enter. Sounds great and thank you for the opportunity!